Relax and calm your busy mind; ease hard-working muscles and restore your body with our perfect milky-moisturising blend of essential oils, mineral salts and herbs. Calms and restores. Smells gorgeous! 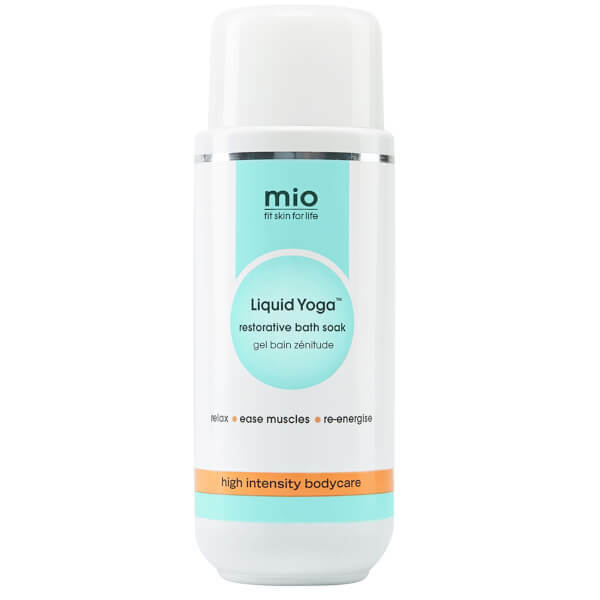 Liquid Yoga is your personal masseuse in a bottle; helping relax tight, stressed shoulders and soothing tired, achy bodies. No other bath treatment is as rich in incredible actives. Magnesium-rich Epsom salts and Arnica and our wonderful blend of essential oils help to ease your stress and anxiety, plus moisturising, Murumuru Butter so your skin feels as good as your mind upon stepping out of the tub. Importantly, it is Sodium Laureth Sulfate and Sodium Lauryl Sulfate (SLS) free. What the heck are we talking about did we hear you ask? Well these two ingredients are probably in almost anything you have that makes bubbles in your home – go ahead check your shampoo, your bubble bath, your dishwashing liquid, your kitchen floor cleaner and your car shampoo. Weird, eh? We thought so to – so we don’t use it, ever. Plus it’s a well-known skin irritant linked to all kinds of not-so-nice things. We don’t want to bore you with too much detail, but google it. We’ve made all our Mio formulas even cleaner with our evolved No Nasties policy. 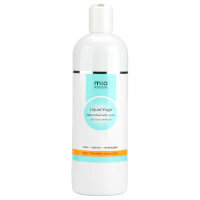 Liquid Yoga is totally free from parabens, petrolatum, colourants, xenoestrogens, PEGs and pthalates. Epsom Salts (Magnesium Sulphate) Magnesium is amazingly effective traditional remedy. Essential Oil Blend An incredible blend of essential oils and extracts, including Mentha Arvensis Leaf Oil, Citrus Lemon Peel Oil, Cypress Leaf Oil and Lavender, to help ease and relax muscles, helps you de-stress and unwind. Arnica Renowned for its soothing properties. Andiroba Oil (Carapa Guianesis) Naturally deep penetrating moisturiser. Horse Chestnut (Aesculus hippocastanum) Seed Extract Rich in Escin plus Quercetin to boost antioxidant protection. Fig Extract Contains antioxidant Vitamin A.
Pour a good glug into a warm running bath. Take your time, stretch out and clear your mind. Then step out of the bath, feeling brand new and ready to face the world again. Liquid Yoga is blended with magnesium-rich Epsom Salts so you will need to SHAKE BEFORE USE. Aqua, Magnesium Sulfate, Caprylyl/ Capryl Glucoside, Prunus Amygdalus Dulcis (Sweet Almond) Oil, Glycerin, Parfum*, Lavandula Hybrida (Lavandin) Oil, Benzyl Alcohol, Linalool, Mentha Arvensis (Cornmint) Leaf Oil, Citrus Limon (Lemon) Peel Oil, Xanthan Gum, Dehydroacetic Acid, Aesculus Hippocastanum (Horse Chestnut) Extract, Arnica Montana (Arnica) Flower Extract, Ficus Carica (Fig) Fruit Extract, Ocimum Basilicum (Basil) Leaf Extract, Salvia Sclarea (Clary Sage) Extract, Astrocaryum Murumuru Seed Butter, Carapa Guaianensis (Androiba) Seed Oil, Cupressus Sempervirens (Cypress) Oil, Cistus Ladaniferus (Cistus) Oil, Citrus Nobilis (Mandarin) Peel Oil, Lavandula Angustifolia (Lavender) Oil, Anthemis Nobilis (Chamomile) Flower Oil, Citral, Geraniol, Limonene, CI75810 (Chlorophyllin Copper). *Blend of Essential Oils. I absolutely love this product. It is both reinvigoratting yet relaxing at the same time. It’s a great product for a relaxing bath after a workout or a busy, tiring day. My most favourite bath oil EVER! This has a gorgeous aroma and is fantastic to help you relax, unwind and de-stress after a busy day. I have tried lots of different bath oils and have never found any as good as this one at relaxing and soothing. I absolutely love it and always have a spare one in the bathroom cupboard as I never went to run out! I adore this bath soak and refuse to use anything else in my baths. I have been using this for a couple of years now and have to say that nothing relaxes me like getting into a bath with Liquid Yoga Bath Soak. It smells beautiful, soothes those achey muscles and I find it difficult to leave the tub! I used to only ever use bubble bath but this product has me completely converted - it is so refreshing and revitalising! Smells like a spa! I love having a bath and this is the most relaxing bath soak I've ever used. I only wish it came in a larger size as I like to unwind every day in a bath so get through the product quickly. Very relaxing scent and leave the body feeling completely stress free. Smell is intense, leaves the bathroom smelling great too! I really liked the candle so I thought I would try the Bath Soak. It has the Liquid Yoga scent but it’s much stronger. If you like the scent of eucalyptus, this might be the product for you, but for me it’s a little much! I love this product. All I need after a long day to relax and zone out. And even better for aching muscles. It just smells like pure relaxation. This is what dreams are made of. I have a bath with pretty much the whole Liquid Yoga range and it's so relaxing. Recommend to anyone! This product actually makes me excited to have a bath and I've made it my little Sunday night ritual that I look forward to every week. This product really is a game changer, the smell is super relaxing and is GREAT for tired muscles. Unlike many bath products I have used which tend to dry out my skin, I don't feel the need to moisturise after using this product as the oils make your skin really soft. I also like to use this with my Liquid Yoga candle - the smell is divine! Literally does what it says. The nicest and most relaxing bath I've ever had and the best nights sleep for months. A definite that I'll always in stock in the bathroom for a special indulgent bath. What I look forward to! I love this stuff, can't get enough of it! The smell is just out of this world and immediately puts me at ease (I had to buy the space spray for my bedroom I love it so much) Being a bath lover, and having tried many products for relaxation/to stop anxiety, this is my absolute favourite and would recommend to anybody. It stops any niggly painful areas around my body before I drift off in to a lovely, calm sleep! This creates a wonderful treat for the body and mind. The scent is so relaxing and calming especially after exercise. It makes the water feel very soft and I love how it's SLS free. Would definitely buy again. Wonderful soothing bath soak that totally relaxes me at the end of a busy, stressful day getting me ready to fall into a deep sleep- Blissful! Great smell, calming and yet restorative and leaves skin feeling soft and hydrated. Can't live without it! I recommend this to all my friends!! I love this product, i was introduced to it through a friend and have personally recommended it to other friends. The smell is amazing and instantly makes you feel relaxed!! I go to the gym 4/5 times a week and love having a liquid yoga bath after, it just really relaxes you! Definitely worth a buy!! I love to look after myself - health-wise, relationship-wise and nothing beats a Saturday morning yoga class followed by a long soak in a bath full of Liquid Yoga! The smell of this is divine, it permeates throughout the house, clears my senses and is so incredibly relaxing. Any stretched muscles from my class are soothed and softened; I leave my bath feeling lusciously languid. I will use this bath soak forever. I wasn't sure what to expect when I first purchased this but I liked the sound of it so decided to give it a try. I wasn't disapointed. The smell is hard to describe but once in the water it turns your bath into a wonderfully aromatic tub of relaxation and bliss. The fragrance literally takes you away to another place and your skin is left feeling soft and moisturised and your mind calm and collected. A must have!